A third ‘authorization decision’ was issued by a Pre-Trial Chamber of the International Criminal Court last week. The Chamber enlarged the scope of the investigation into events in Côte d’Ivoire that had been the object of its decision last October dealing with post-electoral violence. Another Pre-Trial Chamber issued a similar decision in 2010 concerning post-electoral violence in Kenya. The new decision means that the Prosecutor can investigate pre-electoral violence as well as post-electoral violence. These three decisions are the first judicial pronouncements on the exercise of prosecutorial discretion, in accordance with article 15. One of the novel and much celebrated features of the Rome Statute has been the authority of the Prosecutor to proceed with an investigation proprio motu, that is, acting on the basis of his own judgment and without the investigation being requested by either the Security Council or a State Party. Surprisingly, it took several years for the Prosecutor to actually use this power given by the Statute. When the Statute was being drafted, this notion was highly controversial. For example, the United States remained vehemently opposed throughout the negotiations. As an attempt to temper critics of the idea, the Statute includes a degree of judicial oversight. The Pre-Trial Chamber must approve of the Prosecutor’s decision before he can proceed. These three decisions, including the last one, are interesting indications about how this judicial review of prosecutorial discretion will be exercised in practice. In the first two decisions, the Pre-Trial Chambers noted that the judicial review of prosecutorial discretion had been included in the Rome Statute in order to deal with the danger of ‘politicization’ by the Prosecutor. Last week’s decision is much more summary, and does not discuss again the rationale for judicial review. It is surely of interest that both Pre-Trial Chambers contained judges who had been involved, in earlier diplomatic careers, in the Rome Statute negotiations. Judge Kaul, who was in the Kenya Pre-Trial Chamber, had been head of the German delegation, and Judge Fernandez, who was in the two Côte d’Ivoire decisions, was one of the key members of the delegation of Argentina. In last October’s decision, Judge Fernandez noted that the Rome Statute’s provision concerning judicial review of prosecutorial discretion had been proposed jointly by the delegations of – yes, indeed – Germany and Argentina. Thus, those who drafted the provision are now interpreting it! The three decisions indicate that while the alleged purpose of such judicial review by the Pre-Trial Chamber may have been to avoid ‘politicization’, in reality it is a perfunctory assessment of the very same issues that Pre-Trial Chambers consider when they issue arrest warrants. The judges consider whether there is jurisdiction, and whether the admissibility requirements (complementarity and gravity) appear to be met. The only difference is that the standard of proof required from the Prosecutor is not as high for judicial review of discretion as it is for issuance of an arrest warrant. In any event, how could the Pre-Trial Chambers actually assess the ‘politicization’ of a decision to investigate by the Prosecutor? What evidence would they be able to rely upon? The proceeding itself is an ex-parte matter, so the only real evidence that they consider is what comes from the Prosecutor himself. Representatives of victims may have a word in this matter too, but they almost invariably support the Prosecutor. The Prosecutor is hardly likely to bring evidence that might undermine his application. To the extent that there are genuine concerns about politicization, it would be necessary for the Pre-Trial Chamber to go beyond considering whether there is jurisdiction and whether the situation is admissible, which is all that it seems to do now, and look additionally at the situations where the Prosecutor is not attempting to proceed. Only then would it be able to determine whether the Prosecutor was targeting one situation, for apparently politicized motives, while ignoring another. The decision to proceed in Côte d’Ivoire is political in nature. The Prosecutor has decided to devote the resources of the Court to cases in Côte d’Ivoire. At the same time, he has set aside other situations: Palestine, Afghanistan, Colombia, Korea, and so on. We have no explanation for this. If pushed, the Prosecutor will answer with the word ‘gravity’. That is an easy answer, and there is no doubt that the situation in Côte d’Ivoire is grave. But the other situations are also grave. If the Pre-Trial Chamber is to conduct a genuine inquiry into the ‘politicization’ of prosecutorial discretion, it needs the Prosecutor to explain why he is not proceeding in other situations. But this is not what is happening nor is this something that is likely to change. As a result, the judicial review of the prosecutorial to proceed with an investigation in a particular situation looks to be an essentially unnecessary step that simply delays matters. The Commonwealth, Capital Punishment, the History of Human Rights, etc. I've done an issue of Opinions, which is published by the Commonwealth Advisory Bureau, on the issue of capital punishment within the Commonwealth. For those who follow Commonwealth matters, there is an interesting development underway. The Commonwealth is considering whether to adopt a Charter of the Commonwealth. It was proposed last October by an Eminent Persons Group that included several prominent human rights personalities. The concept was endorsed at the Commonwealth Heads of Government meeting in Perth. Australia has already prepared a draft, which is based upon several earlier pronouncements by Commonwealth bodies. Tomorrow I will be testifying before the Canadian Senate's Committee on Foreign Affairs and International Trade about the Charter of the Commonwealth. I'm in Ottawa (where it is -13C) today to deliver a lecture at the University of Ottawa about the International Criminal Court. Thursday and Friday I'll be attending an interesting conference at McMaster University in Hamilton on the history of human rights where, it seems, we'll be debating the hypotheses of Samuel Moyn, Canadian involvement in drafting human rights instruments, the role of groups within Canadian civil society including blacks, aboriginal peoples and Jews, and other issues. I've been immersed in issues relating to the history of human rights as part of my current project, a compilation of the travaux préparatoires of the Universal Declaration of Human Rights. The material, which runs to more than 1.2 million words, is fully indexed and annotated. I'm now completing the introduction before sending it to the publishers, Cambridge University Press, who should produce it later this year or early next year. The French Constitutional Council has declared recent legislation providing for criminalization of genocide denial to be unconstitutional. Under French law, the Constitutional Council may provide preliminary rulings on constitutionality of legislation. As is the style of the French Constitutional Council, the decision is laconic and does little more than state the basis of its finding. The legislation in question made it a crime to deny the existence of genocides that have already been legally recognized. The Constitutional Council seems to have objected to the whole idea that genocide can be recognized by legislation, and said that this did not provide an acceptable normative basis for making an act criminal. 6. Whereas a legislative provision whose purpose is to “recognize” genocide cannot, in itself, have the normative force that law requires; however, section 1 of the impugned act punishes contestation or minimization of the existence of crimes of genocide “recognized as such by French law”; that in so punishing the contestation of the existence and the legal qualification of crimes that it has itself recognized and qualified as such, the legislator has breached the constitution and freedom of expression and communication; consequently, and without it being necessary to consider other challenges to the legislation, section 1 of the impugned act is declared to violate the Constitution; section 2 cannot be severed and is therefore also in breach of the Constitution. 49. Laws that penalize the expression of opinions about historical facts are incompatible with the obligations that the Covenant imposes on States parties in relation to the respect for freedom of opinion and expression.[116. So called “memory-laws”, see communication No. , No. 550/93, Faurisson v. France. See also concluding observations on Hungary (CCPR/C/HUN/CO/5) paragraph 19.] The Covenant does not permit general prohibition of expressions of an erroneous opinion or an incorrect interpretation of past events. Restrictions on the right of freedom of opinion should never be imposed and, with regard to freedom of expression, they should not go beyond what is permitted in paragraph 3 or required under article 20. I note that the reference in the footnote to the Faurisson case is a mistake, as Faurisson does not support what paragraph 49 of the General Comment states. My suspicion is that paragraph 49 was altered during the deliberations of the Committee and that in the final draft the Committee forgot to remove the inappropriate reference to Faurisson. 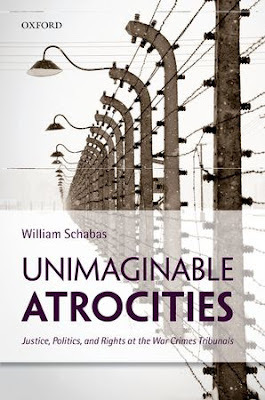 My latest book, Unimaginable Atrocities: Justice, Politics,and Rights at the War Crimes Tribunals, was published by Oxford University Press a few days ago. The book consists of eight chapters that address major and controversial issues in the field of international criminal law. Each one represents a different aspect of my own thinking and experience, based upon two decades of studying international criminal tribunals and transitional justice. This is not a collection of previously published articles. Each chapter is new, drawing upon the latest developments in the field. Consisting of 240 pages, the book is issued in hardcover and priced at £34.99. As international criminal courts and tribunals have proliferated and international criminal law is increasingly seen as a key tool for bringing the world's worst perpetrators to account, the controversies surrounding the international trials of war criminals have grown. War crimes tribunals have to deal with accusations of victor's justice, bad prosecutorial policy and case management, and of jeopardizing fragile peace in post-conflict situations. In this exceptional book, one of the leading writers in the field of international criminal law explores these controversial issues in a manner that is accessible both to lawyers and to general readers. The title, Unimaginable Atrocities, is taken from the preamble to the Rome Statute of the International Criminal Court. Daughter: How are you coming along with that ipad we gave you for Christmas? Daughter: Have you figured out all those apps? It is the professorship in human rights law at the National University of Ireland Galway. The job also involves directing the Irish Centre for Human Rights. This is a wonderful opportunity for an established scholar to lead the Irish Centre for Human Rights through its second decade. The job is full of opportunity and excitement. Please spread the word so that the best candidates apply for this great job. The International Journal of Criminal Justice, founded by the late Antonio Cassese, marks ten years with the publication of Vol. 10, No. 1. It is a very impressive special issue on the crime of aggression, edited by Claus Kress and Philippa Webb. On Monday, the Governor-General of Australia hosted a reception for the Conference at her Sydney residence, Admiralty House. She has a pretty nice view from the front lawn, and I couldn't resist taking a photo. I’ve been in Sydney this week attending a conference at the University of New South Wales entitled “Justice For All? The International Criminal Court. A Conference: 10 Year Review of the ICC”. 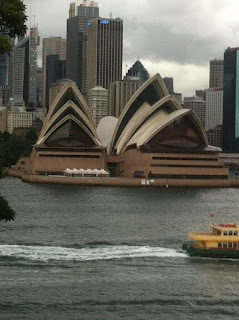 The organizers note that just as Sydney is the place to celebrate the new year first, so it is the first to mark the initial decade of the International Criminal Court. Participants in the conference included the President of the Court (Judge Sang-Hyun Song), the Deputy Prosecutor and Prosecutor-elect (Fatou Bensouda), the Registrar (Silvana Arbia) and the President of the Assembly of States Parties (Ambassador Tiina Intelmann). In addition to the general theme of marking the tenth anniversary, the conference has focussed on gender justice and the role of the Court in the Asia-Pacific region. Impatience with the Court’s performance to date was expressed by several speakers. There is a need to “chalk up some runs” as one speaker put it. It is gratifying to learn that the long-awaited first judgment on the merits, in the Lubanga case, will be released next month. Lubanga was taken into custody by the Court in The Hague on 17 March 2006, so that will make just about exactly six years for someone in detention to get to judgment in a single-defendant trial involving a single charge of recruiting child soldiers. That’s simply far too long. En passant, I was told that the Charles Taylor trial at the Special Court for Sierra Leone should also be delivered in March. Ambassador Wenaweser expressed dissatisfaction about the funding of the Court’s work when the situation is initiated by the Security Council. According to the two Security Council resolutions (1593 and 1970), the United Nations is not to contribute to any of the funding of the Court’s activities that result. This is not what is in the Rome Statute and it is inconsistent with the Relationship Agreement between the Court and the United Nations, Ambassador Wenaweser noted. “We cannot have situations in which States (including non-party States) send things to the Court and then don’t pay”, he said. “In the future we have to think about the benefits for the Court” of Security Council referrals, he said. Ambassador Wenaweser was saying that “we don’t need any more Security Council referrals”. He was followed on yesterday’s panel by Ambassador Stephen Rapp of the United States. Ambassador Rapp explained that while the Obama Administration is endeavouring to help the Court, it is constrained by legislation adopted under the Bush Administration, notably the American Servicepersons Protection Act. “We can’t send cash but we can provide in kind assistance.” He said that the United States was helping with relocation of victims and witnesses, and that it was trying to get legislation passed by Congress that would allow it to use its reward programme to help with prosecutions at the Court. “We want the ICC to succeed”, he said. In answer to a question about how the United States viewed ratification of the Rome Statute by other States, Ambassador Rapp said his country was happy with this. The number of States Parties now stands at 120, which is double the requirement in the Statute for entry into force and equivalent to the number that voted in favour at the Rome Conference. We were told that more ratifications are to be expected soon. Fatou Bensouda said she expected Côte d’Ivoire to join in the near future. Despite well-deserved criticism of the Court’s performance, and particularly its inability to deliver a single verdict after a decade of work, the Conference showed a strong sense of optimism about the future of the institution. Several speakers noted the significance of last year’s Security Council resolution referring Libya to the Court. It was a unanimous resolution, enjoying the support of the United States, Russia, China and India, in addition to the other permanent and elected members of the Council. The Court is a permanent fixture in the international world order and that in itself is a supreme accomplishment. This afternoon, we managed to get from our home in snowbound London to the National Theatre for a wonderful Abbey Theatre production of Sean O’Casey’s Juno and the Paycock. Browsing in the bookshop before the production, Penelope stumbled upon Theatre and Human Rights, by Paul Rae, who is assistant professor on the theatre studies programme at the University of Singapore. Rae’s book is a short introduction to the subject (less than 100 pages). The study focuses on a limited number of plays, notably Sophocles Antigone and Ariel Dorfman’s Death and the Maiden (which we saw in London a few months ago; the tickets were a going-away gift from my Galway colleagues). Less obvious, perhaps, is Rae’s focus Samuel Beckett’s Waiting for Godot. He makes the remarkable connection between the writing of En Attendant Godot, which Beckett did in Paris (in French) from October 1948 to January 1949 and the drafting of the Universal Declaration of Human Rights, which took place in Paris at exactly the same time. It is very much welcome that writers attempt to link human rights to the fine arts. At the Irish Centre for Human Rights in Galway we tried to do this a few times with music, holding a seminar on ‘Mozart and Human Rights’ in 2006, and one on ‘Ulysses and Human Rights’ in 2004. Some people may have found them a bit contrived, yet it is so important do show and develop the relationship between the values that underpin modern human rights law and the various representations and manifestations of the human condition that we find in music, theatre and the other fine arts. Today we have a fascinating decision from the International Court of Justice concerning State immunities and serious violations of international humanitarian law. The case, styled Jurisdiction Immunities of the State(Germany v. Italy: Greece Intervening), was taken by Germany against Italy in response to judicial action relating to second world war claims. Some of these originated in Greece, although they led to enforcement measures in Italy, which explains the Greek intervention. Germany prevailed, by twelve votes to three (judges Cançado, Yusef and Gaja (ad hoc) dissenting). The judgment contains important statements about immunities. It also offers the most detailed consideration to date by the Court of the concept of jus cogens or peremptory norms and their relationship to other rules of international law. 57. The Court considers that the rule of State immunity occupies an important place in international law and international relations. It derives from the principle of sovereign equality of States, which, as Article 2, paragraph 1, of the Charter of the United Nations makes clear, is one of the fundamental principles of the international legal order. This principle has to be viewed together with the principle that each State possesses sovereignty over its own territory and that there flows from that sovereignty the jurisdiction of the State over events and persons within that territory. Exceptions to the immunity of the State represent a departure from the principle of sovereign equality. Immunity may represent a departure from the principle of territorial sovereignty and the jurisdiction which flows from it. One of Italy’s main arguments was that there was an important exception to the general rule of immunity where serious violations of international humanitarian law – war crimes and crimes against humanity – were concerned. In a closely related argument, Italy contended that there could be no immunity because the prohibition of war crimes and crimes against humanity was a norm of jus cogens and therefore would prevail. Immunity from jurisdiction is an immunity not merely from being subjected to an adverse judgment but from being subjected to the trial process. It is, therefore, necessarily preliminary in nature. Consequently, a national court is required to determine whether or not a foreign State is entitled to immunity as a matter of international law before it can hear the merits of the case brought before it and before the facts have been established. If immunity were to be dependent upon the State actually having committed a serious violation of international human rights law or the law of armed conflict, then it would become necessary for the national court to hold an enquiry into the merits in order to determine whether it had jurisdiction. If, on the other hand, the mere allegation that the State had committed such wrongful acts were to be sufficient to deprive the State of its entitlement to immunity, immunity could, in effect be negated simply by skilful construction of the claim. (para 82). This point reminded me of claims by the Prosecutor of the International Criminal Court with respect to allegations of genocide. He has argued, I think, that special obligations exist upon States to cooperate with the Court in the Bashir arrest warrant because Bashir was charged with genocide. His contention has been that the arrest warrant is somehow energized by the addition of a genocide charge, as a result of the ruling of the Appeals Chamber. According to the decision, ‘The Court concludes that, under customary international law as it presently stands, a State is not deprived of immunity by reason of the fact that it is accused of serious violations of international human rights law or the international law of armed conflict.’ (para. 91) Although rejecting the argument that the nature of the crimes is not sufficient to eliminate immunity, the Court takes some care to distinguish its ruling from another judgment that may be in conflict, namely the Pinochet ruling of the House of Lords of 1999. It insists that ‘it is addressing only the immunity of the State itself from the jurisdiction of the courts of other States; the question of whether, and if so to what extent, immunity might apply in criminal proceedings against an official of the State is not in issue in the present case’. The reference to the Pinochet case is interesting because in the Court's last major discussion of immunities, the 2002 Arrest Warrant case, it seemed to be overruling the conclusions of the House of Lords. This argument therefore depends upon the existence of a conflict between a rule, or rules, of jus cogens, and the rule of customary law which requires one State to accord immunity to another. In the opinion of the Court, however, no such conflict exists. Assuming for this purpose that the rules of the law of armed conflict which prohibit the murder of civilians in occupied territory, the deportation of civilian inhabitants to slave labour and the deportation of prisoners of war to slave labour are rules of jus cogens, there is no conflict between those rules and the rules on State immunity. The two sets of rules address different matters. The rules of State immunity are procedural in character and are confined to determining whether or not the courts of one State may exercise jurisdiction in respect of another State. They do not bear upon the question whether or not the conduct in respect of which the proceedings are brought was lawful or unlawful. That is why the application of the contemporary law of State immunity to proceedings concerning events which occurred in 1943-1945 does not infringe the principle that law should not be applied retrospectively to determine matters of legality and responsibility (as the Court has explained in paragraph 58 above). For the same reason, recognizing the immunity of a foreign State in accordance with customary international law does not amount to recognizing as lawful a situation created by the breach of a jus cogens rule, or rendering aid and assistance in maintaining that situation, and so cannot contravene the principle in Article 41 of the International Law Commission’s Articles on State Responsibility. 95. To the extent that it is argued that no rule which is not of the status of jus cogens may be applied if to do so would hinder the enforcement of a jus cogens rule, even in the absence of a direct conflict, the Court sees no basis for such a proposition. A jus cogens rule is one from which no derogation is permitted but the rules which determine the scope and extent of jurisdiction and when that jurisdiction may be exercised do not derogate from those substantive rules which possess jus cogens status, nor is there anything inherent in the concept of jus cogens which would require their modification or would displace their application. There are three dissenting opinions, the most detailed and elaborate of them penned by Judge Cançado. As in his earlier pronouncements, he takes a position that is very firmly underpinned by a commitment to human rights. He situates his argument principally on the basis of the rights of victims to redress. These are preliminary impressions of a significant ruling by the International Court of Justice that is destined to impact on a range of human rights and international criminal law matters. Iraq executed 51 people in the month of January, including 17 in one single day. This makes Iraq the worst place on earth for capital punishment. At that rate, Iraq is now averaging 19 executions per million population per annum. By comparison, in the most recent report of the United Nations Secretary General on the status of the death penalty, the highest rates were 3.34 for Saudi Arabia and 3.29 for Iran (see UN Doc. E/2010/10, p. 9). In that report, issued two years ago, Iraq was at 0.92. Virtually everywhere else in the world, including notably the United States and China, the death penalty is in sharp decline. Pakistan, for example, once an important practitioner of capital punishment, appears to have stopped altogether. Major declines are expected in the Arab countries that have been touched by the so-called ‘Arab spring’. The exception is this little knot of countries in the Middle East – Iraq, Iran, Saudi Arabia and Kuwait. I suppose this is the democratic dividend that Rumsfeld, Bush and Blair were going to bring to the region when they invaded Iraq in 2003. Does the Prosecutor Only Investigate Incriminating Evidence? The current focus of the investigations is twofold. First, it continues the collection of evidence against Saif Al-Islam Al-Qadhafi and Abdullah Al-Senussi in preparation for their eventual trial… (See S/PV.6647, p 3). Is the Prosecutor’s statement merely careless use of language, or does it actually indicate his perspective on the cases?